Since 1995, JINAN SAIXIN MACHINERY CO., LTD, is always the professional and earlier manufacturer and leading company for advanced and high efficient extrusion food machinery in this field. Our company congregates an expert team, which has over twenty years experiences in this industry. They work hard to explore constantly not only in the research of extrusion technology, but also in food technics, to benefit our clients producing newfangled food in their local markets. With our many years research and development, extrusion technics has been widely used in more fields. 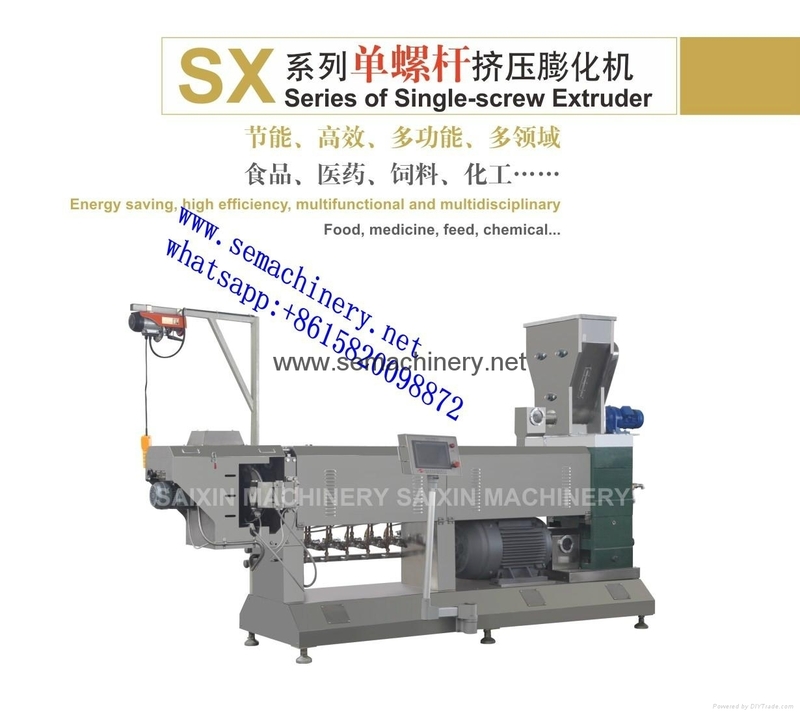 Our products consist of core filling extrusion snack machine, Tortilla corn chips machine,bugles machine, twin screw extruder,food extruder, breakfast cereal and corn flakes machine, pet food machines and floating fish feed machinery, dog chewing food machine, aquarium fish feed machines,textured soya protein machine,modified starch machine,artificial rice machine,bread crumb machine,single screw extruder,potato chips machine, instant noodle machine and biscuits machine, instant flour machine,flat bread machine. In additional, we also produce pop corn machine, automatic fryer, seasoning machine,flavoring machine, and drying machine and meat forming machines ect. We can also provide special design and product according to our clients` special requirements. Firstly we develop innovative applications of food extrusion technology and follow up with complete product development. 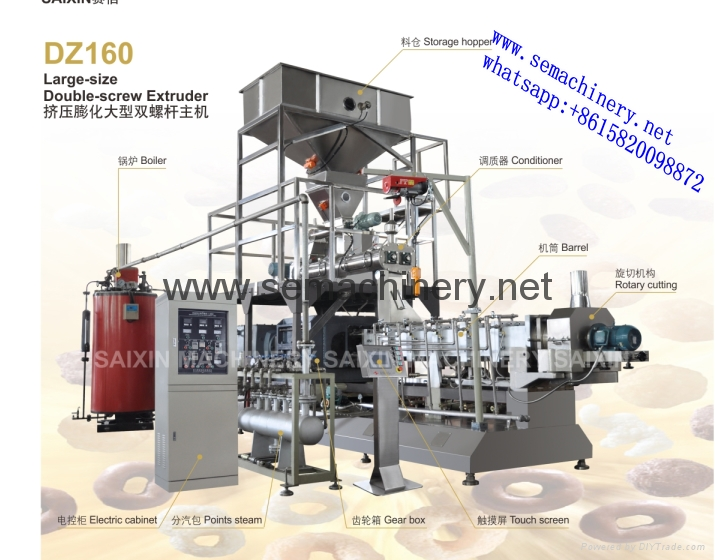 Secondly, we design and produce food extruders and all related machinery required for the production of extruded snacks, breakfast cereals, co-extruded products, flat bread, instant flours,pet food,fish feed,animals feed,modified starch etc. 8) Automatic cooling system after sugar coating to ensure packaging in time. 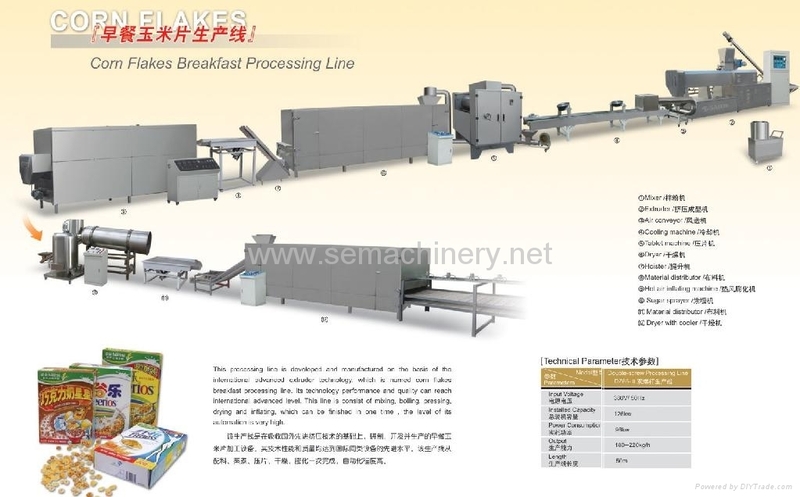 Corn Flakes Processing Line can produce all kinds of corn flakes and breakfast cereal with various shapes, such as round, rings and stars, etc. We also have many tastes for choices, such as original tastes or sugar sprayed. Also, we can make new shape or recipe as buyer's requirements. The whole production procedure is completely automatic . The basic flow chart is almost the same as Italian Pavan's processing line. Thus the final products are in good quality, crispy and golden shine.